Search the MLS in Arizona for: Horse Properties and Ranches for sale in Arizona For free, see detailed listings, prices, photos, maps, satellite images and more! Interested in ranches in Scottsdale, Phoenix, Tucson, Sedona, Prescott, Flagstaff or other locations in Arizona? Then you have come to the right place. Sit back, grab a cup of coffee and see what is for sale. Are you a cowboy looking for a new ranch? Check out the desert horse properties with cacti and sunsets. Or, look at high desert or even pine tree ranches with riding trails, views and live in the stunning beauty and tranquilty of the great desert southwest. Put on your boots partner and lets enjoy the home search ride together. 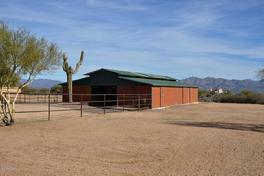 There are many horse properties in Arizona, but with a barn? Not so many. Some properties have horse zoning but no set ups. Others have a corral, other horse shades. A real barn? That is a desired upgrade value, especially in the hot sun or colder evenings. Ranch homes with a barn in Arizona. Click the barn to see ranch homes with a barn for sale.